Assistant Professor Richard Lang recently published a book chapter on the contribution of collaborative housing models for sustainable communities and cities. It is based on results from an international comparative study funded by an APART-fellowship of the Austrian Academy of Sciences and a Marie Curie Fellowship of the European Commission. The book chapter features case studies from collaborative housing projects in Austria and England which emphasise aspects relevant to current challenges in urban development. The analysis focuses on two particular aspects of social sustainability – social inclusion and social cohesion – and draws on social capital as a suitable analytical perspective. This ground breaking volume raises radical critiques and proposes innovative solutions for social sustainability in the built environment. 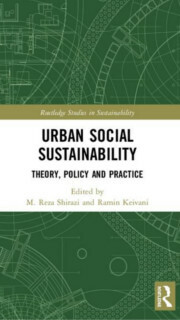 It consists of original contributions from academics and experts within the field and explores the significance of social sustainability from different perspectives such as urban policy, transportation and mobility, urban space and architectural form, housing, urban heritage, neighbourhood development, and urban governance. Lang, R. (2019). Social sustainability and collaborative housing: Lessons from an international comparative study. In M.R. Shirazi, and R. Keivani (eds. ), Urban Social Sustainability: Theory, Policy and Practice (pp. 193-215). London: Routledge.